Files should be prepared as a Word document using font size 12 Times New Roman characters, double-spaced and with 2.5 cm margins on each side, top and bottom. Only standard abbreviations should be used; other shortened phrases should be indicated in parentheses as used in the text. Generic or chemical names of drugs should be used instead of trade names. Authors of reports of original research should present an accurate account of the work performed as well as an objective discussion of its significance. Underlying data should be represented accurately in the paper. A paper should contain sufficient detail and references to permit others to replicate the work. Fraudulent or knowingly inaccurate statements constitute unethical behavior and are unacceptable. Review and professional publication articles should also be accurate and objective, and editorial ‘opinion’ works should be identified as such. Appropriate consents, permissions and releases must be obtained where an author wishes to include case details or other personal information or images of patients and any other individuals in publication. Written consents must be retained by the author and copies of the consents or evidence that such consents have been obtained must be provided to us on request. Particular care should be taken with obtaining consent where children are concerned (in particular where a child has special needs or learning disabilities), where an individual’s head or face appears, or where reference is made to an individual’s name or other personal details. Requirement for consent: Appropriate consents, permissions and releases must be obtained where we wish to include case details or other personal information or images of patients and any other individuals in an publication in order to comply with all applicable laws and regulations concerning the privacy and/or security of personal information, including, but not limited to, the Health Insurance Portability and Accountability Act of 1996 and other U.S. federal and state laws relating to privacy and security of personally identifiable information, the European Union Directive 95/46/EC and member state implementing directives, Canadas’ Personal Information Protection and Electronic Documents Act, Indias’ Information Technology Act and related Privacy Rules. It is the responsibility of the author to ensure that each individual, or the individuals’ legal guardian or other person with legal authority to act on the individualâs’ behalf who appears in any video, recording, photograph, image, illustration or case report (or in any other identifiable form) is made aware in advance of the fact that such photographs are being taken or such video, recording, photograph, image, illustration or report is being made, and of all the purposes for which they might be used, including disclosure to its licensees in any work or product. That individual, legal guardian or person with legal authority must give his/her explicit written consent. If such consent is made subject to any conditions (for example, adopting measures to prevent personal identification of the person concerned), E Journal of Cardiovascular Medicine must be made aware in writing of all such conditions. Written consents must be retained by the author and copies of the consents or evidence that such consents have been obtained must be provided to us on request. It is the responsibility of the author to ensure that the form of written consent complies with each requirement of all applicable Data Protection and Privacy Laws. Particular care should be taken with obtaining consent where children are concerned (in particular where a child has special needs or learning disabilities), where an individuals’ head or face appears, or where reference is made to an individuals’ name or other personal details. In the case of a child, if parents or guardians disagree on the use of the images of that child, then consent should be deemed not to have been given and those images should not be used. It is also important to ensure that only images of children in suitable dress are used to reduce the risk of images being used inappropriately. Even if consent has been obtained, care must be taken to ensure that the portrayal and captioning of the individual concerned are respectful and could not be seen as denigrating that individual. Special considerations for patient and research subject permissions Patients’ and research subjects’ names, initials, hospital or social security numbers, dates of birth or other personal or identifying information should not be used. Images of patients or research subjects should not be used unless the information is essential for scientific purposes and explicit permission has been given as part of the consent. Even where consent has been given, identifying details should be omitted if they are not essential. If identifying characteristics are altered to protect anonymity, authors should provide assurances that such alterations do not distort scientific meaning. Non-identifiable images Formal consents are not required for the use of entirely anonymised images from which the individual cannot be identified- for example, xrays, ultrasound images, pathology slides or laparoscopic images- provided that these do not contain any identifying marks and are not accompanied by text that might identify the individual concerned. Requests that are not sent by the corresponding author will be forwarded by the Journal Manager to the corresponding author, who must follow the procedure described above. Any requests to add, delete or rearrange author names in an article published in an online issue will follow the same policies as noted above and may result in a corrigendum. Original articles should consist of sections titled as “Abstract, Introduction, Materials and Methods, Results, Discussion and Conclusion”. For information about the abstract, refer to ‘Manuscript Formatting’ section. The Introduction section of the manuscript should clearly state the purpose of the manuscript and include a brief summary of the most relevant national and international literature stating the main purposes and research question of the study. Contradictory aspects of the research, if present, should be mentioned. The expected contribution of this study to family medicine and practice should be highlighted. The Materials and Methods section should describe the study population and the study design, with adequate information on the techniques, materials and methods used. The section should include information of the study type, population, sample, sample size and selection of the sample. Validity and reliability of scales and questionnaires used also should be referred to. A clear description of the statistical methods should also be given. The Results section should include a detailed report on the findings of the study. All figures, tables and illustrations should be used in this section. Results should be presented either as text or figures and/or tables and not be replicated. The Discussion section of the study should emphasize the importance of the results and compare them with the results of other authors with relevant citations from the most recent literature. Study limitations and strengths should be specified. Suggestions for further studies in this area should be added. The Conclusion should include the main conclusions based on the results of the research, emphasize the contributions of the study to family practice and propose original suggestions. A brief revision of all the results and the discussion should be avoided. Original articles excluding case reports and systematic reviews should not exceed 3000 words excluding the abstract, references and tables. Case reports should not exceed 1000 words excluding the abstract, references and tables. There are no restrictions for systematic reviews. Short Reports are accepted when the research topic, aim and results of the study are in limited in scope and in cases that do not require writing a full original article. Short Reports can be described as a summarized version that have been prepared according to the structure of research articles. Publishing an article as a short report does not reflect a lower quality. The same rules as relevant to original articles apply to preparing a short report, but structured abstracts are not mandatory references and tables should not exceed 6 and 2 in number, respectively. Abstracts should not exceed 100 words and the text should be restricted to a maximum of 1000 words. Reviews are evidence-based articles about a specific topic using relevant citations from the most recent literature with the authors’ conclusions on this subject. The author is expected to have conducted research on the subject and to have experience in order to discuss and analyze the subject. There is no obligation to follow a particular format and may contain subtitles depending on the subject. The text should not exceed 4000 words excluding the title, abstracts, references and tables. E Journal of Cardiovascular Medicine, only publishes review articles solicited by the editors. Letters to the editor or comments can be sent to provide commentary and analysis concerning an article published in the journal, to give information about ongoing research, to provide information in cardiology and cardiovascular-vascular-endovascular surgery, cardio-metabolic and vascular sciences. Letters to the editor or comments may include an optional title, tables and references. These articles should not exceed 1000 words. These are brief articles discussing cases and situations encountered in cardiology and cardiovascular surgery with a biopsychosocial approach. If necessary, photographs (with permission from the patient/owner) may be added. Sections should consist of a title, case report, discussion, questions and answers. Brief comments can be sent to provide commentary on previous articles and case reports written by other authors. Comments should include the number of the journal the article was published in. The text should not exceed 1000 words. Translations of important documents, declarations and guidelines prepared by international organizations in the field of cardiology and cardiovascular surgery, may be published in the journal. Presubmission Inquiry to the Editorial Board of the Journal before submitting the article is recommended. It is the translator’s responsibility to obtain permission from the owner of the original manuscript for publication and translation. These articles focus on advances and innovations in clinical topics relevant to cardiology and cardiovascular surgery. There is no obligation to follow a particular format. The text should be limited to 1000 words. 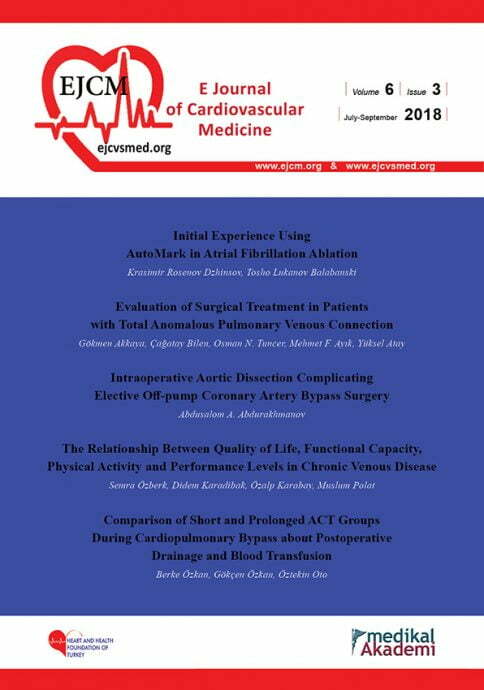 Editorials usually provide information about the editorial policy of E Journal of Cardiovascular Medicine, give commentary and feedback on articles published in the journal, draw attention to topics of current interest and give information related to and discuss the development of cardiology and cardiovascular surgery in the world. They are mainly written by the members of the Editorial Board. Editorials are limited to 2000 words with some exceptions and may include a title and references when necessary. The title page of the manuscript should include: The title, first and last names of each author. Complete affiliation and title for each author, with the name of department (s) and institution (s) to which the work should be attributed. The corresponding author should be clearly identified with name, address, telephone- facsimile number and email address for correspondence about the manuscript. Authors should clearly indicate if the article has previously been presented at a congress or scientific meeting. The title should be concise and informative without abbreviations and not exceed 10 words. Abstract should be in English, with a minimum of 150 and maximum of 350 words. Abstracts of original research articles should be structured under subheadings as follows: objectives, methods, results and conclusion. A maximum of 3 key words should be added to abstracts. The text contains the rest of the manuscript. It is structured differently according to the type of manuscript (original research article, review, etc.). For example, original research articles should consist of aim and objectives, methods, results, discussion and conclusion. References should be cited in consecutive numerical order as first mentioned in the text and designated by the reference number in parentheses. If the number of authors for the reference is more than 6 authors, list the first three authors and add “et al”. Journal names should be abbreviated as used in Index Medicus. References should be cited in the Vancouver style. For detailed information please visit the relevant link. – Verschuren WM, Jacobs DR, Bloemberg BP, et al. Serum total cholesterol and long-term coronary heart disease mortality. JAMA 1995; 274(2): 131–6. – Rakel RE. The family physician. In: Rakel RE, editor. Textbook of family practice. 5th ed. Philaldelphia: W.B. Saunders; 1995. p. 3-19. – Guidance for clinicians. An International Benchmarking Study. http://www.who.int/topics/surgery/ accessed: 29/09/2002. Legends should take place on the top of the page for tables, and bottom of the page for figures and placed on separate pages. Explain all nonstandard abbreviations in footnotes.